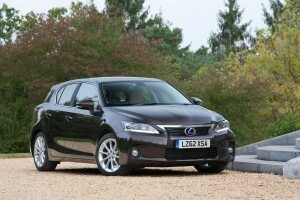 Here at the Firstvehicleleasing blog we like Lexus cars (well I do!) and now the firm has announced the new CT 200h Advance, we are really impressed. The new model is a high-specification, high value addition which includes a bumper list of standard features including satellite navigation, reversing camera, auto-dimming rear-view mirror, rain-sensing wipers, folding door mirrors and cruise control. There’s also the introduction of Lexus’s new Tahara upholstery, which is lighter and cleaner to produce than leather. Customers can choose from four metallic paint shades, including Celestial Black which is exclusive to the Advance. According to the colour chosen, the Tahara trim can be specified in black or tan. In other respects the Advance mirrors the CT 200h SE specification, with premium features such as dual-zone climate control, push button start, Bluetooth, fog lights, rear privacy glass, 17-inch alloy wheels and a six-speaker audio system with USB port. Its refined and highly efficient Lexus Hybrid Drive full hybrid system delivers official figures of 94g/km (qualifying for zero annual road tax) and 68.9mpg combined cycle fuel consumption. For the car, those are impressive figures. As well as its normal driving mode, the driver can select from three on-demand modes EV, Eco and Sport, to tailor performance for greater efficiency or a more engaging drive. In EV mode the car can be driven with zero tailpipe emissions and minimal noise for up to 1.2 miles (according to road conditions and the level of charge in the hybrid battery). Available to order now, the Lexus CT 200h Advance price £24,495; first deliveries to customers before the end of the year. This entry was posted in News and Views and tagged alloy wheels, audi, caption, car, Celestial Black, climate control, Cruise Control, CT, EV, firstvehicleleasing, lexus, Lexus Advance, Lexus cars, lexus CT, Lexus CT 200h, Lexus CT 200h Advance, Lexus Hybrid Drive, LS, mini, price, Sport, USB by Steve Lumley. Bookmark the permalink.